SENSR is a pain diagnostics system designed to intervene in the flawed system of pain management and help reduce instances of opioid abuse in the US. The components are three-fold: a small adhesive sensor patch that measures pain via detecting electrical signals sent to the brain, a hand-held diagnostic wand for use by doctors, and a pain visualization system represented on an app that both patient and doctor can use as a communication tool. 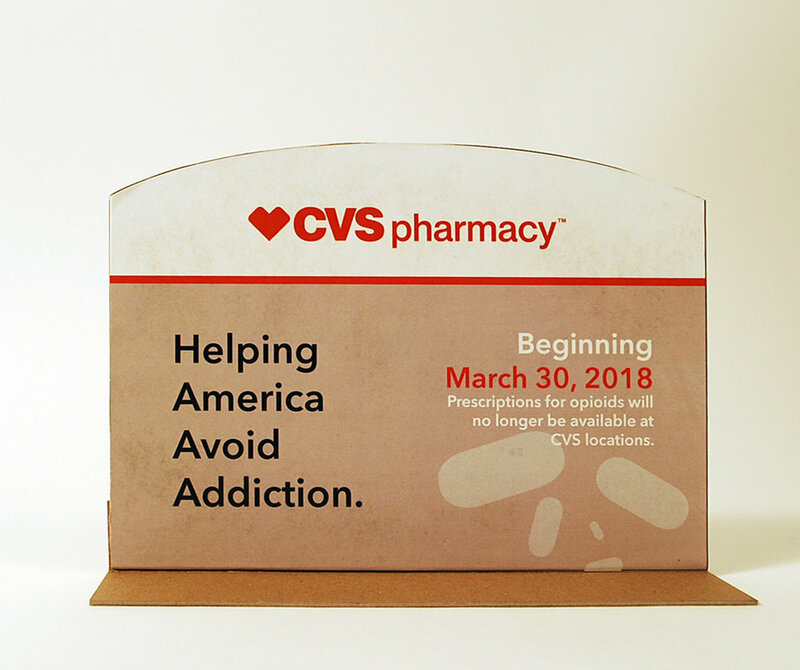 The United States consumes 80% of the world’s opioid supply despite representing only 5% of the world’s population. Despite this, instances of chronic, unresolved pain persist among much of the nation's healthcare recipients. SENSR intervenes in this system by targeting the inconsistent, subjective methods of diagnosing pain currently practiced in the US by creating an objective, standardized, and easily measured diagnostic tool for both patients and doctors. 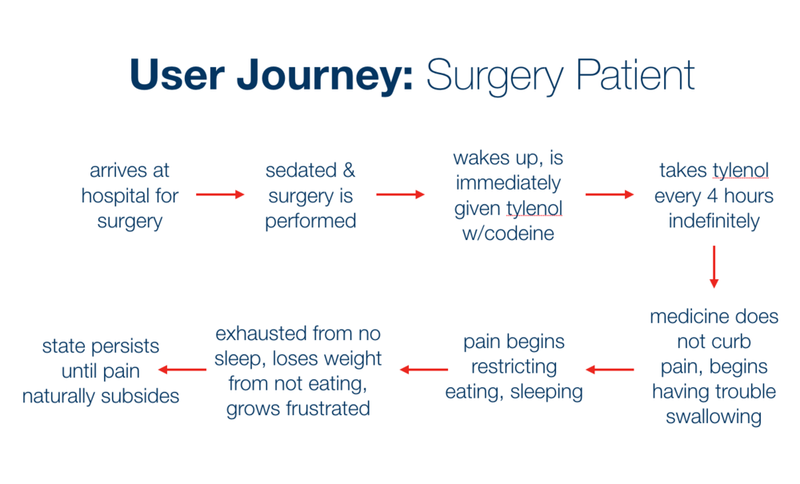 SENSR aims to rectify the systematic misuse and abuse of opioids by intervening early in the user’s journey of pain management, during their first interaction with a doctor. There are disconnects between how the patient describes their pain in contrast with how the doctor understands their pain report, the abstract, subjective nature of pain self-reporting in contrast with the objective, analytic nature of other medical measuring procedures, and finally between different departments within a hospital systems, which a patient may have to navigate on their own. 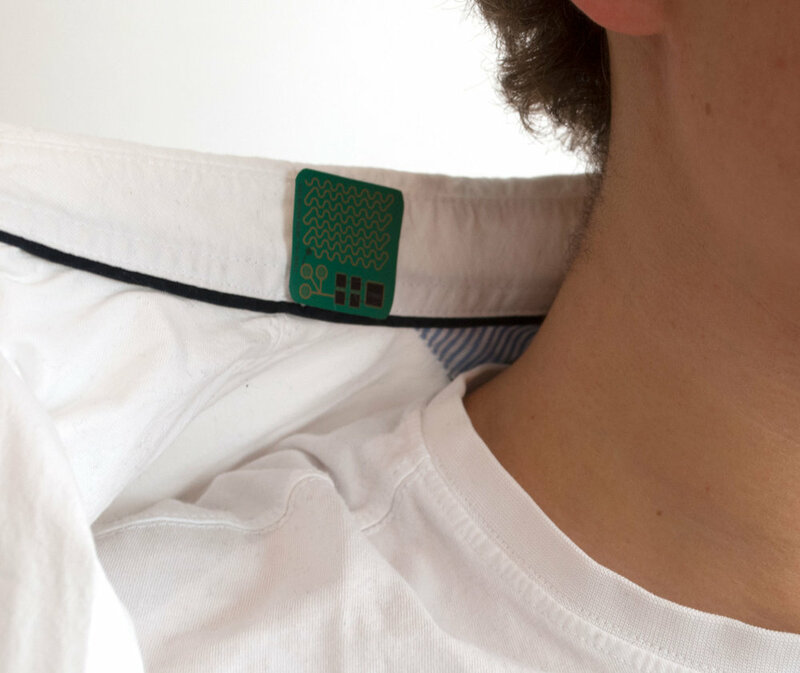 Theoretically, SENSR works by adhering to the patient’s skin directly (or on his or her clothing, keeping in mind that pain may be generated by burn wounds) and monitors the flow of signals via neurons through the spinal cord and into the brain, where pain is experienced. The sensor would send that information via Bluetooth to the patient’s phone or computer, and that information would take the form of an easy-to-read visual. The added benefit of SENSR taking the form of a wearable is that the patient can continuously monitor pain fluctuations and generate a visual histogram for long-term chronic pain. The histogram serves as a communication tool between doctor and patient. Lastly, SENSR also takes the form of a pain-sensing hand-held wand, which the doctor will use for visiting patients with acute pain. 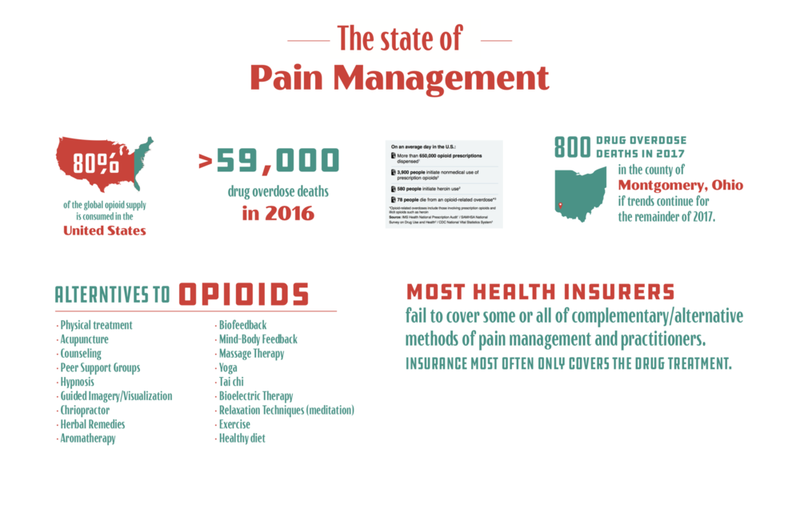 We bagan by researching the metrics of opioid addiction and pain management. After, we went into the field and interviewed people who suffer from chronic and acute pain. We also interviewed doctors and alternative pain healers. 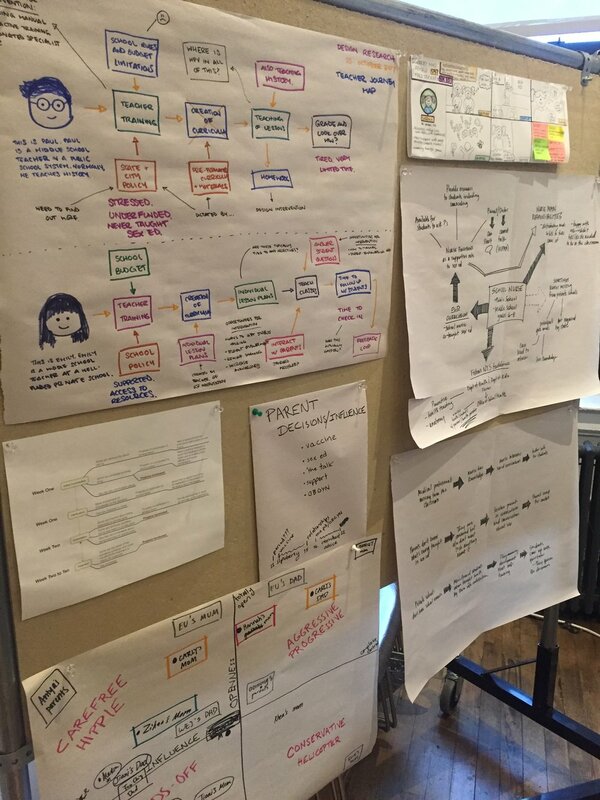 From there, we generated ideas and created prototypes. These prototypes were brought back into the field where we received feedback from experts at J&J as well as doctors and patients. Our more than 100 initial ideas were broad, ranging from a locked pill dispenser to a shock test to analyze one’s pain threshold. 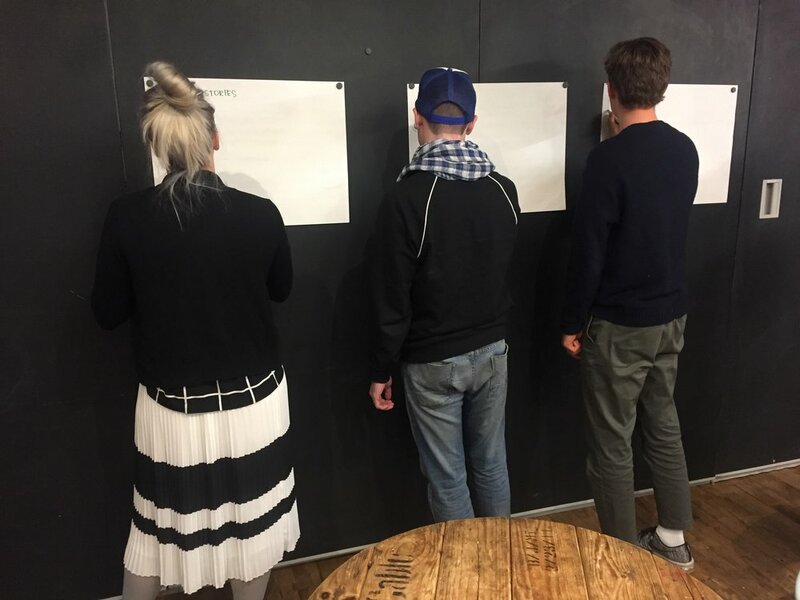 These wild ideas enabled us to pick and choose the best elements of each, inform them with our field research, and proceed into further prototyping.